Critical Beauty: Getting To Know DAYANNA GRAGEDA - Miss Earth Australia 2015! Getting To Know DAYANNA GRAGEDA - Miss Earth Australia 2015! 1. Tell us a little about yourself, your family background, education, and how you became Miss Earth Australia 2015. I was born in Bolivia and moved to Australia with my family when I was 2 years old, where I grew up in Sydney. Since I can remember I have loved nature and animals, I have been looking after orphaned and injured wildlife since I started school. When I was 14 I found out I could volunteer at animals shelters as a cadet from St John Ambulance and since then I began volunteering everywhere I could. Charity became a lifestyle for me. When I finished school it was inevitable for me to study animal and veterinary bioscience at university and travel around the country and overseas to study and volunteer with animal conservation groups. After graduating I was offered a job at Taronga Conservation Society where I worked as a zoo keeper, taking care of all sorts of animals and educating children about them. Today I still passionately volunteer for humanitarian and wildlife conservation charities such as Sydney Metropolitan Wildlife Services and Hands and Feet (feeding the homeless). I am a passionate bush care volunteer for my local city council and community and an ambassador for Operation Restore Hope who provide surgical care for the less fortunate children of the Philippines with cleft lip and palate deformities, and more recently for Take 3 for the sea, a clean beach initiative. Basically my life’s passion and everything that I do is about taking care of our earth and the earthlings that share its land and oceans, so when I found out about Miss Earth it became my dream. So when I finished my first university degree I went for it, wholeheartedly, and never gave up. 2. How did you become interested in pageants? I became interested in pageants because of Miss Earth. I stumbled across a Miss Earth bio whilst doing some research on a science assignment. I was crazy actually! I was so inspired and in awe by the mission and purpose of Miss Earth because it resonated so deeply with me. I admired the Miss Earth and the projects she was involved in and affiliations with charities I admired, and looked up to her as role model for a young 14 year old child. I dreamed that one day I would become like her and be the voice for our animals and nature and initiate change for the better. 3. How does it feel to represent Australia in Miss Earth 2015? It feels like a dream come true! It feels like the I’ve been given the biggest privilege so far as I feel like an ambassador for a country that I love and admire with all my heart, the country that has shaped me into the woman I am today and taught me so much about life. I am so happy but at the same time I want to do so much more to help my people go in the right direction for the benefit of our planet. 4. Give three adjectives that your friends would use to describe you. 5. Tell us about one life-changing experience in your life. Since it’s still fresh in my mind, I’d have to say being unfairly dethroned last year after I won Miss Earth 2014 has been the biggest life-changing experience for me. It was without a doubt the hardest challenge in my life that I had to cope with because I was robbed of something so special and so meaningful to me, which I had worked hard to achieve and was so happy to have accomplished. It really hurt. But I got through it with the support and love of my family and friends and of course my faith in God. I had to find inner strength I never knew I had. I learnt a lot about how strong I really am and how resilient we can be emotionally and mentally. I also had to grow a whole lot of courage to return again to Miss Earth Australia 2015. But I did it, and I am grateful that I never gave up. I’ve learnt that if you have a dream…It doesn’t matter what happen in the past, the past is like an anchor that holds us back, we have to let go of the past to become who we want to be. 6. Name three things that you would never do. I would never ride on an elephants back because it actually hurts them, I would never litter and I would never buy a fur coat. 7. What do you like to do for fun? Go the beach, go shopping with friends, and visit the zoo or a nice botanical park. 8. What would constitute a "perfect" evening for you? A delicious dinner with great food, and great company with lots of laughs and shared stories followed by a walk on the beach listening to the ocean waves under the stars. 9. Tell us a little bit about Australia and what makes the country different from the rest of the world? The Aboriginal people of Australia have a rich, living culture stretching back at least 50,000 years. They believe in living with the land, not off it and teach one another to preserve not destroy the land. Land is fundamental to their wellbeing, it is not just soil or rocks or minerals, but a whole environment that sustains and is sustained by people and culture. We are also home to the world’s largest reef system, the Great Barrier Reef which is so big that is visible from outer space! It is made up of over 900 islands stretching for over 2,600 kilometres and is composed of over 2,900 individual reefs, 1625 species of fish, 30 species of whales and dolphins and much more! Every corner of Australia has something interestingly different and beautifully colourful to see. 10. What do you think is the biggest environmental problem facing Australia and what can you do about it? The biggest environmental problem Australia is facing today is climate change. Climate change is affecting our temperatures around the country as we have experienced an increase in flash flooding, bush fires and prolonged drought. We have had our hottest days ever recorded this year as our temperatures continue to rise. We are also still burning fossil fuels for our main source of energy leading to an increasing amount of carbon dioxide in out atmosphere which is being absorbed by our oceans and increasing the water’s acidity levels. This is causing a detrimental impact on our coral reef which plays a critical role in our Great Barrier Reef ecosystem, forming habitats and food sources for thousands of species. As Miss Earth Australia I want to bring about awareness and education amongst the people in my country so they are aware of the factors which contribute to climate change and provide them way and ideas on how we can reduce our carbon footprint (the amount of carbon dioxide we each produce) and ways to live more sustainably. This can be done through school visits, community gatherings and appearances on television and news prints, raising the issue of climate change. I also want to speak to environmental politicians to motivate them to push forward renewable energies into our homes, schools and businesses and replacing oil and goal generated energy all together. Within my community I can get more involved with organisations and campaigns that promote sustainable living and lead by example for others to follow and highlight the importance of climate change. It is no longer just an environmental issue it is a humanitarian and ethical issue. Droughts and drastic temperature fluctuations cause food shortage and bushfires and floods cause the loss of many lives and homes. 11. How will you motivate others to practice sustainable living choices? I believe that to motivate others we first need to help them to understand the importance of a cause. Through educational campaigns I want people to realise the direct effect our way of life and our actions impact and damage our ecosystems from the accumulations of plastics in our oceans to the expelling of carbon dioxide from our homes and cars. But more importantly I want to focus on creating solutions and alternatives, to give them tools and ways to change their way of living and embracing a life of harmony with our earth. Starting simple and at home and eventually changing communities, governments and the world! I am sure that once people share the same vision and understanding they will feel so happy and grateful for our earth. They’ll realise the positive impact they are having and will encourage others to follow also. 12. If you were to make a time capsule to represent life today, what would you put in it? I would put an iPad that contains images of the world as it is today, a mixture of our culture, music, arts and pictures of our landscapes. 13. If you woke up tomorrow and gained any one ability or quality, what would you want it to be and why? I would definitely want to be able to fly! Then I would be able to fly to different countries to save animals all over the world that are being neglected or mistreated. I would also be able to take pictures from up in the sky to show people and governments of the effects of our actions are having on our environment, such as land clearing and pollution. 14. How would you describe Mother Earth to a blind person? Mother Earth is more than just a visual experience. It is an experience of all our senses. You can feel the warmth of sun’s rays, breathe in the fresh ocean air, touch the textures of the forests, taste the fruits and listen to the songs of birds. There aren’t enough words to describe the wonders of Mother Earth so instead I would take the blind person to Mother Earth and let her do the talking. 15. Why do you want to be Miss Earth 2015? I want to be Miss Earth because this title represents everything that I believe in, that I am passionate about, that I have lived up to and everything that I am. The mission of Miss Earth is my mission, with or without a crown. I have and always will be an earth warrior but with the crown I would be more influential. My heart is in this cause as I have always wanted to help those who are less fortunate than me especially those without a voice. I grew up rescuing animals and reading about the devastating circumstances our environment faces and every time my heart would break. I grew more determined to fight against the destruction, and now as a woman with a voice, I want to create change to stop the suffering, to stop the pouching, to stop the burning, to stop the destruction and to save our earth. Miss Earth is more than just a pageant. For me, it’s the honor and responsibility of being an ambassador, an educator, a role model and a protector of our earth for every creature on this earth. I want to share this passion with the world so that people everywhere can teach our future generations to also care for our earth, like crating ripples of change that go on forever. Special thanks to Peter Sereno of Dear Pageant Girl for facilitating this interview! 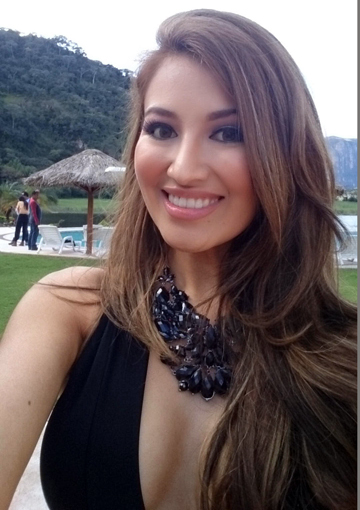 Critical Beauty wishes the best of luck to Dayanna at Miss Earth 2015! Miss World America 2016: Rigged? Scam Alert: Who Is George Buchis? (C) Copyright 2012 Critical Beauty. Simple theme. Powered by Blogger.